The Sole TT8 Treadmill is On Sale! 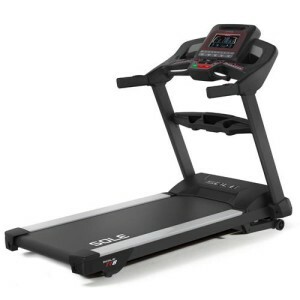 If you are looking for a heavy duty treadmill with power to spare and an extra 22″ wide belt, the Sole Fitness TT8 is an excellent choice. This treadmill is designed for serious users. In addition to selling it for residential use, they offer the TT8 for light commercial sales, which means it is engineered to withstand the abuse of either runners or multiple users. A further indication of the quality of the Sole TT8 is the recent review from a prominent consumer magazine. The TT8 received the third highest ratings of all the treadmills that were tested. It rated “Excellent” for construction and ergonomics, and “Very Good” for ease of use, exercise range and user safety. The newest 2016 model has Bluetooth capability so you can track your workout stats using a free smart app. The Sole TT8 is priced at $2,499 with free shipping. A good value! Bluetooth compatible – This newest 2016 model has Bluetooth capability so you can track your workout stats using the free app from Sole Fitness. The machine will also work with other compatible fitness apps. Incline and Decline – Running both up and down hills on your treadmill will provide a more realistic workout to develop your leg muscles. Plus, it’s pretty fun! Not many machines have a decline so this feature is worth taking notice. 10.1″ TFT LCD Display – This easy to read display allows you to track your workout stats. It’s clear and easy to manipulate. 4.0 continuous duty HP motor. With a motor this size you will always have power to spare. This monster of a motor is ideal for sprinting and interval training. It has two fans to keep it running cool. 3″ rollers. As we’ve mentioned in other reviews, larger rollers are always better. These are the largest treadmill rollers you will find at any price range. Larger rollers reduce wear and extend the life of the rollers, motor, bearings, and belt. 1″ reversible deck, meaning your can turn over the deck to extend the life. Heavy duty 2-ply treadbelt, designed for a commercial setting. The Sole TT8 Treadmill weighs in at a hefty 322 lbs., guaranteeing a solid and stable feel. Residential Warranty – Lifetime frame, motor, and deck, 5 year parts and 2 year labor. When we were at the Sole corporate headquarters we asked who buys the Sole TT8? The response was, “People who want our very best running machine.” Often, it is individuals who gave up their health club membership and are looking for a comparable machine to the one they used in the club. It is also buyers who need a treadmill for a light commercial setting that can withstand hours of daily use and multiple users. The Sole TT8 is warranted for both residential and commercial settings, which says something about the durability of this machine. Furthermore, the strong endorsement by a leading consumer magazine is evidence that the TT8 is one of the best values in its price range. The technology advancements on this newest 2016 model are a great addition. Now, you can keep track of your fitness stats so you can make better progress towards your goals.